From all of our team at The Press Gallery to all of you, we wish you Happy Holidays, a Merry Christmas and a Very Happy New Year. We appreciate your friendship and business, and look forward to serving you in 2018. Thursday, December 21 – Regular counter hours and delivery service. Friday, December 22 – Counter open 7:00 a.m. until 12:30 p.m., closed that afternoon; regular delivery service. Saturday, December 23 – Counter open 9:00 a.m. until 1:00 p.m.; no delivery service. Monday, December 25 – Counter and delivery service closed all day. MERRY CHRISTMAS! Tuesday, December 26 – Counter and delivery service closed all day. HAPPY BOXING DAY! Wednesday, December 27 – Counter open 7:00 a.m. until 6:30 p.m. (regular hours); delivery service will call only*. Thursday, December 28 – Counter open 7:00 a.m. until 6:30 p.m. (regular hours); delivery service will call only*. Friday, December 29 – Counter open 7:00 a.m. until 6:30 p.m. (regular hours); delivery service will call only*. Saturday, December 30 – Counter open 9:00 a.m. until 5:00 p.m. (regular hours); no delivery service. This will be our last service day at the Counter at 9440 Jasper Avenue. Monday, January 1 – Counter and delivery service closed all day. HAPPY NEW YEAR! Tuesday, January 2 – Counter open 7:00 a.m. until 6:30 p.m. (regular hours); regular delivery service resumes. *Because of holiday disruptions and closures at so many offices and businesses, will call only delivery service means that regular customers will not receive a regular pickup or delivery between Dec. 27 and 29 unless they call in and request service, request a pickup on the mobile application, or speak with their Valet Representative. 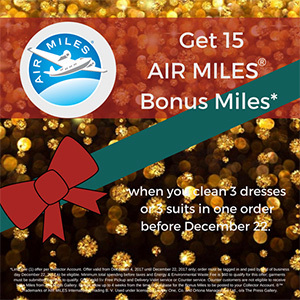 The Press Gallery is excited to offer you 15 AIR MILES® Bonus Miles* when you clean 3 Dresses or 3 Suits in one order before December 22, 2017. It’s not goodbye, but see you soon! - Convenient service at your door. - Base AIR MILES on all your cleaning as well as Bonus Miles. - No extra charge for pickup and delivery. FREE pick-up and delivery with our App, download now. We will be closed on Saturday, November 11 AND Monday, November 13 for REMEMBRANCE DAY. 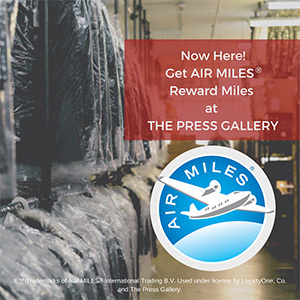 The Press Gallery is excited to announce that you can now get AIR MILES Reward Miles on all orders that we pick up from you or deliver to you. Current Valet customers, make sure that you call in to register your AIR MILES Collector Number with us so you don't miss a mile! Counter customers, next time you're at The Press Gallery, register for home or office delivery and get AIR MILES on your next order. The Loyal Edmonton Regiment Museum will be open on November 11 for Remembrance Day 10AM to 2PM. The Press Gallery is proud to support The Loyal Edmonton Regiment Museum, which is located in the Prince of Wales Armouries. We have successfully restored and maintained the Museum's uniforms, which date back to the First World War. Over 17,000 square feet to serve you better. Our new 17,000 plus square foot facility is coming along ahead of our impending move. We are installing new state of the art technology to serve you better! Stay tuned for our opening day announcement. We are Moving to Serve You Better! Thanks to you, we have outgrown our current location. We will be able to offer you expanded service, including even offering full Saturday service! We are looking forward to inviting you to our grand opening in 2018 and want to ensure you continue to receive the service you and your wardrobe have been accustomed to. You can of course follow us to 17511 – 107 Avenue, but the best way to ensure uninterrupted service is to have your Press Gallery cleaning delivered and picked up right to your home or office door for no additional charge using our Valet Service. Take time to register for this free and convenient service by either calling 780-425-0739, emailing our service team at valet@pressgallery.ca or most conveniently by downloading our free App – Another Edmonton first. Dry cleaning and laundry services at your doorstep have never been easier. Schedule your free and convenient pick up and drop off with the touch of a button. The additional advantage of using the App: it is available 24/7, your credit card information is encrypted, therefore secured, and we offer an additional bonus for referring a friend through the App, making your cleaning even more affordable. To thank you for your years of patronage we are offering all our existing customers who convert from counter service to our App a onetime $25.00 Free cleaning certificate. Use code I.LOVE.TPG when you upload the App or place your first order using in the app and we will do the rest! Our system will automatically validate you are an existing counter customer. The Press Gallery is proud to announce we will begin to offer you Air Miles on select orders starting next month. Stay tuned for the exciting details coming soon! The Press Gallery offers you Award Winning Service at your doorstep. Just awarded for 2017, one of the three best rated drycleaners for the 3rd year in a row! We are also the proud recipient of the 2017 top-choice award for DryCleaning services (5 years in a row), and the 2017 Edmonton Journal’s reader’s choice award (2 years in a row). Join us in support of Edmonton Opera’s premiere of Lilies (Les Feluettes), running from October 21 to 27th. Purchase tickets here. We can get the dirt out of anything! While you enjoy the Labour Day weekend game or the return match the week following, contact us for Free Pick-up and Delivery using our "Wash and Fold" service. We will make the clothes something you are proud to wear.